Polbase - Reference: Structural and biochemical analysis of sliding clamp/ligand interactions suggest a competition between replicative and translesion DNA polymerases. Most DNA polymerases interact with their cognate processive replication factor through a small peptide, this interaction being absolutely required for their function in vivo. We have solved the crystal structure of a complex between the beta sliding clamp of Escherichia coli and the 16 residue C-terminal peptide of Pol IV (P16). The seven C-terminal residues bind to a pocket located at the surface of one beta monomer. 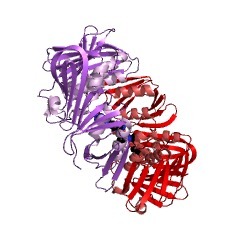 This region was previously identified as the binding site of another beta clamp binding protein, the delta subunit of the gamma complex. We show that peptide P16 competitively prevents beta-clamp-mediated stimulation of both Pol IV and alpha subunit DNA polymerase activities, suggesting that the site of interaction of the alpha subunit with beta is identical with, or overlaps that of Pol IV. This common binding site for delta, Pol IV and alpha subunit is shown to be formed by residues that are highly conserved among many bacterial beta homologs, thus defining an evolutionarily conserved hydrophobic crevice for sliding clamp ligands and a new target for antibiotic drug design.